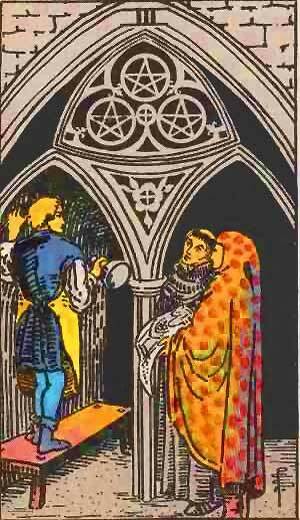 The Three of Pentacles in a Tarot reading is about laying the foundations of a solid relationship that will last and is a good omen for marriage. In the reversed position the lack of scruples can lead to the relationship crumbling when under pressure. Métier, trade, skilled labour; usually, however, regarded as a card of nobility, aristocracy, renown, glory. Mediocrity, in work and otherwise, puerility, pettiness, weakness. If for a man, celebrity for his eldest son. Three of Pentacles – Nobility, Elevation, Dignity, Rank, Power. Children, Sons, Daughters, Youths, Commencement. The Fire on the Seventh house, which rules the contact of the Self and the Not-self, the relations between both, the executive ability in man. So this must lead to the idea of well-doing and noble demeanour, owing to the Sun and Venus again. Compare horoscopes with the Sun and Venus in VII. Well-conducted relations denote civilisation, aristocracy, and the proper expression of one’s relation to the world in his occupation, his métier, as Waite has it; profession, marriage and employment. So this card has to do with ‘workmanship,’ which is well expressed by the drawing of the card in the set of Waite. On the face of the cube is the symbol of Saturn, for among the Divine Numbers, 3 is called the Sphere of Saturn. Note that here, as in the succeeding numbers, up to and including 9, we are dealing with the spheres of planetary action, not with the planets themselves. The sphere of a person’s activity is in the field in which he works. Similarly, the sphere of a planet’s activity is the field of that planet’s operation. Numerologists, and others accustomed to using other numbers for the planets, should remember that we have very ancient authority for these attributions. See Eliphas Levi’s Dogma and Ritual of Transcendental Magic, Henry Cornelius Agrippa’s Natural Magic, Knorr von Rosenroth’s Kabbala Denudata, and other standard works on occultism. In the Knapp Tarot the evil hexagram, with the black triangle upward, is part of the symbolism, but it does not agree with the meanings of the card. The second decanate of Capricorn, under the rulership of Venus, from January 1st to 10th. Construction; increase, growth; financial gain; the building up of favorable conditions; gain in commercial transactions; rank or prestige in vocation or business; beginning of matters to be perfected later. Selfishness; cleverness in business, but lack of scruples; narrow and prejudiced; too much ambition. More information on the Three of Pentacles Tarot card. This entry was posted in Tarot, Runes and Divination and tagged capricorn, evil, feelings, love, monks, pentacle, tarot, the sun, the world, three of pentacles. Bookmark the permalink.